Meditation develops mind, and permanently elevated levels of perception, problem solving and consciousness. Can we stop teaching children the building-blocks of reality, language, citizenship and morality if we teach them to meditate? Is this the way to create a world of loving-kindness in which building-blocks are known to be empty causes of confusion and division? By example, monks claim to enlighten the world by perfecting themselves and teaching that suffering arises from clinging to a fixed self in an objective reality imprisoned in time. Do they? We are well aware of the danger of undervaluing a healthy ego. We don’t want students to succumb to melancholy, depression and suicide, and we don’t want them harming others on rampages of resentment and vengeance either. We want them to be centred, confident and successful, and only drawn to the ladder of spiritual practice with a natural desire for enlightenment. Is there anything worse than organized ignorance? Ask the Rohingya. Ask the Arakanese. Meditation is natural. Not only mystics do it, but birds do it, crustaceans do it, and perhaps even the trees do it. Can you imagine any living thing not desiring to prolong bliss or the glimmer of self-consciousness? Is it not ultimately an instinct for transcendence that will overturn this bucket of crabs you find yourself in? Way back at the dawn of civilization the ancestors imagined into being an aid to the task of clambering out of the bucket. Answers to the question, ‘How do I fit into the scheme of things?’ come from within the nascent consciousness formed by meditation, but how to get in there to control the answers, how to be sure we are not just sacrifices to time in an eternal crab-race? Clamouring with the antediluvian authority of journalists on social media, the white cockatoos rearrange themselves on the tree of life. You never see them, unless you are evolved indeed! Their raucous flight takes place, and is impossible not to hear, in the underworld houses beneath the ground, where they endlessly challenge the Monk’s mind with ancestral bypass. Like the numerals on the back of football jerseys, and the nations of the Earth, their bodies are interchangeable. Antares, 11 million years old, is 550 light-years away, a supergiant 12 times the Sun’s mass, 680 times its diameter and nearly 100,000 times its luminosity. Its nightfall transit heralds the arrival of true Spring’s generic obligations in the South. It is one of the cardinal Royal Stars. Uriel represents an ancient argument about the basis of stability, triangle or square. They are variously the angel of repentance, the pitiless, the south wind, patron of the arts and of confirmation, angel of the face and the earth, one of the four angels of the presence, ruler of Tartarus. They are in awe of what is occulted by Earth. Canopus is a bright giant 310 light-years distant, 8 times the Sun’s mass, 71 times its diameter, and 10,700 times its luminosity. Its right ascension places it in Breamlea Zodiac Gemini, and those in the North above latitude 35° who can never see it can reason its upper transit beneath the southern horizon on a line projected from Mirzam and Tejat, and its opposite lower transit below Kaus Australis. Sandalphon’s head reaches to heaven, and like music, is firmly rooted in, yet soars beyond, the body of the world. As the immortalized Elijah, they are the protector of the unborn, and their almost human cry resonates with the pangs of your faltering attainment. Altair, 1.2 billion years old, is one of the closest stars visible to the naked eye, about 16.7 light-years. It has about 1.8 times the Sun’s mass and 11 times its luminosity. It spins so fast, once every 8.9 hours (compared to the Sun’s 25 days), that it is 20% flattened at the poles, and observably brighter at the poles than the equator. It is prominent in August and September nights. 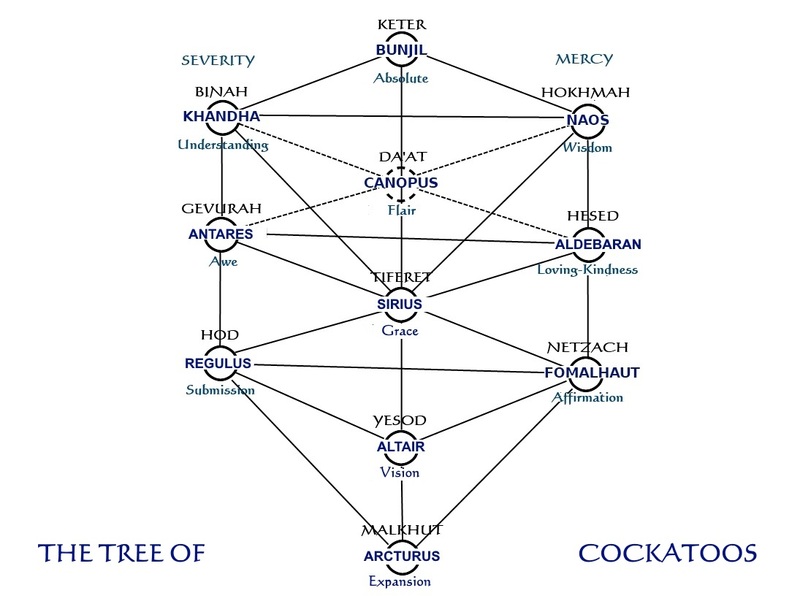 Akathriel, an angel of the presence, and possibly God themself, is the angel to some of Kether (meaning ‘crown’), the topmost of the sefirot of the Tree of Life, and no wonder here in the Tropics, but in temperate latitudes they find themself outscreeched up there. Anything for a quiet life, says the circling Yesod eagle. They have 8,760 eyes, one for every hour of the year. Fomalhaut is about 449 million years old, 25 light-years away. Nearly double the size of the Sun, it is 16 times more luminous. Its visible transit more or less overhead in Chile, Argentina, Southern Africa, Australia, New Zealand and the South Pacific begins in June and disappears in November, heralding Summer. It is one of the four Royal Stars, the watcher of the south (at the Winter Solstice of 2,600 BCE–in 1,150 years it will be at the Northern Vernal Equinox). Gabriel is God’s messenger, the plucker of new souls from the Tree of Life, the guardian angel of Israel and the bearer of revelation to prophets, such as Muhammad. Gabriel administers severity in the North, and may accordingly assist in death. In the South they squawk to the other side of the tree. They announce high summer, and affirm the victory of instinct. Achernar, 139 light-years away and 37 million years old, is the first magnitude star on its own opposite the Southern Cross on the South Celestial Pole clock. It spins so fast, rotating every two days, that its equator is 56% greater than its polar diameter. It blinks on at upper transit at the latitude of Melbourne, Florida, and is visibly circumpolar below Melbourne, Australia. Seven times the size of the Sun and 3,150 times more luminous, it lurks below the southern horizon at Tehran. Belial is the archangel of cleansing and hostility to hell, but that is because they are reformed. Historically the angel of darkness and destruction, one of the fallen ones, they may have fathered Lucifer and been the avatar of Satan, but liar that they are, they seek to overcome their worthlessness by promoting self-sufficiency and personal accomplishment. They would have you address them as Independence, or Headwater, but their tight wheel brings a waterboarded Cassiopeia to mind. Aldebaran is an orange giant 44 times the diameter of the Sun and 425 times its luminosity, though only 1.7 times its mass. Aldebaran is 6.6 billion years old, nearly half the age of the universe, and around 65 light-years away. It is the eye of the Bull and the baleful follower of the Seven Sisters. Michael is the highest in rank of the angels, leader of the armies of God against evil, the Prince of Israel and the archangel of mercy (it was they who substituted a ram for Isaac). They are in charge of the soul of justice, and roost in the west side of the tree, on your right facing south, or remember, on your left if you go behind the tree. Regulus, a star-system of two pairs of dwarves, is about a billion years old and 79 light-years distant. The main star rotates every 16 hours, has over 3 times the Sun’s mass and 360 times its luminosity. Its name, meaning ‘little king’, identifies it with the basilisk of mediaeval bestiaries. It is one of the Royal Stars marking the cardinal quarters, and is notable for its regular occultations by the Moon, and its encounter every 8 years with Venus. Raphael is the healing archangel, bestowing submission to the severity of the wound with a healthy sarcasm, directed towards the tropical duality of meditative connection and theology’s engrossment in perfectionism, often misinterpreted by those unfamiliar with the spirits of the underworld, being focussed only on cognitive diagnosis. What do stars and angels, higher consciousness and music, social media and stigma, gender and mental illness all have in common? They are in the body! Ah, Monk, you smooth talker! You have me in two minds. You are certainly higher than I on the ladder leaning to heaven’s restoration of innate human divinity, and if Lamarckian inheritance of acquired characteristics, the permanent improvements you have made to your consciousness, and pharmaceutical or psychedelic alternatives to our disembodied spirituality can all be combined, the pilgrim’s progress may prove to the benefit of all, but if gamma waves prove barely to rustle the leaves of the tree of life, suspended as it is above a lower realm of struggle and strife, and the most heightened consciousness cannot elude its underworld, might we not be wise to use meditation on the body which is the world the mind is embedded in, to connect us to history, and to forgive us our past and theirs rather than engineer a future unlike it? Turn off the lights so that children can see the stars. Encourage the inexperienced to be alone, carry a tune, remember change, and blaspheme against the prophets’ words with their non-binary, non-perfectionist bowels. Let children discover the underworld of country in sidereal time and project the houses of the Vertex onto their social firmament before we teach them its emptiness and the existence or otherwise of angels.